Cinnamon Girl's Command Bridge eliminates the need for a full helm station below and allows the creation of a large dining table for 8 forward in the pilothouse. The view from the raised pilothouse is excellent and you can see outside in all directions. The master stateroom is below the Pilothouse in the center of the yacht and is full beam. The 1,400 HP CAT's will let you cruise at 24 knots and she is stabilized. Her 3,000 gallons of fuel will let her do over 600 miles at 24 knots or 2,800 miles at trawler speeds. There are 4 staterooms for owners and guests with three full heads. Cinnamon Girl was built with full crew quarters for a captain and mate aft and features a private entrance. United Yacht Sales New Jersey would love to guide you through a personal showing of this 72' Marlow 72e 2007. 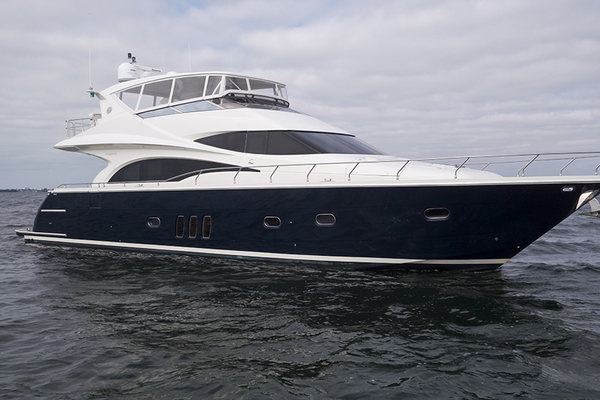 This yacht for sale is located in Long Boat Key, Florida and priced at $2,300,000. For a showing please contact us by filling out the form on this page and we will get back to you shortly! See Cinnamon Girl Virtual Tour:https://www.vpix.net/index.php?tour=451494This yacht has four staterooms and three full heads. The enclosed command bridge allows the standard large lower helm area to become a beautiful dining area forward of the galley. Crew quarters are aft of the engine room with a private entrance on deck and accommodate two with a private head and shower. The salon is very spacious. The tinted windows let in just the right amount of light and have custom-made teak blinds. Salon accommodations include a sofa, chairs, and entertainment center with a large pop-up LCD TV. A full-size bar is on the port side of the forward salon area. The Pilothouse is very spacious. Instead of a large lower station that is unnecessary in a Command Bridge model a large seating area with teak table is located forward. The galley is aft of the dining area and is open to the salon. A small helm station is on the starboard side of the staircase to the staterooms. This was built to allow an owner / operator to join the family in the pilothouse and operate the vessel. The galley is centrally located on the main deck at the aft end of the pilothouse. The pilothouse is two steps up from the salon. An opening under the aft galley cabinets allows visibility right through to the salon and aft deck. The galley counters are Raw Silk granite and the undermounted sink is on the forward side of the galley counter so you are looking out the front windows of the pilothouse when standing at the sink. The Dacor cooktop on the starboard side of the U-shaped counter has removable stainless steel sea rails to keep pots from moving about on the smooth glass cooktop. The Sub-Zero refrigerator and freezer drawers are on the aft end of the galley right behind the sink and dishwasher. The galley has generous cabinet space with louvered doors to keep the cabinets well ventilated. The full beam owner's suite is just forward of the engine room amidship, and is separated from the engine room by insulated bulkhead and fuel tanks. The bed is centerline and there are teak nightstands on each side of the bed with beveled glass mirrors and reading lamps above. The head is aft of the bedroom on the starboard side and has a double sink, VacuFlush toilet and large stall shower. To aft starboard is a walk in closet. There are five hanging lockers and lots of drawer space. The TV is on the forward wall of the stateroom. Six opening port lights let plenty of light in. The VIP Suite is forward and features optional overhead bunks. This allows Mom and Dad to have a full king berth and small children to be overhead. The Stateroom has two large hanging lockers and six large storage drawers. The head is on the starboard side and has a full size shower. This guest stateroom has twin berths with a large storage locker between them. Forward of the bunks there is a full height hanging locker. The private head has granite counters, a china sink with Grohe faucet, and a separate stall shower. This yacht is constructed with the most modern materials and techniques providing more strength with less weight than possible with conventional technology. The use of Kevlar, modified epoxy resins, and high density core materials allows the Marlow Explorer to be stronger than the heaviest of hulls at a fraction of the weight. Modern honeycomb and structural foam is used on every counter, cabinet and sole in the yacht. Even if speed is not a driving factor for you, the increased range and reduced fuel costs will be of great benefit. This yacht has a state of the art Simrad Package including twin radars (12kw and 4kw), Simrad sounder module, two 15" Simrad displays at the Command Bridge and a 10" unit at the lower station. She also has Simrad IS 15 multifunction wind direction, wind speed, and boat speed indicators, and a Toshiba 26" monitor at the Command Bridge helm station. This displays the Nobeltec, Camera data, and Flir night vision. The engine room has full standup headroom and is air-conditioned. There is good access to all sides of the engines. The sea chest is at the forward end of the engine room and provides sea water to the engines, generator, air-conditioning, and all the other items on the yacht that need sea water for cooling. Each item has its own shut-off valve for servicing. The two 1500 gallon fuel tanks are just in front of the forward engine room bulkhead. This is the center of buoyancy of the yacht so your running angle will not change as your fuel level changes. The fuel tanks also provide an additional layer of soundproofing between the engines and the cabins forward. The cockpit has uninterrupted teak decks and a built in seating area with table. This yacht has an extended boat deck that provides full overhead protection from rain and sun in the cockpit. The salon door is very large and when it is open the cockpit and salon become one entertaining area. Transom doors lead to the oversize swim platform. The swim platform leads to a transom door accessing the engine room and crew quarters. There is a docking station in the cockpit that has engine controls, thruster controls, VHF radio, Simrad Jog lever steering (for rudder control), and an IS 15 multifunction dislay for wind speed, direction, and water depth. Custom hawse pipes in the corner of the transom with rollers and rope storage lockers. Molded FRP stairway to flybridge and boat deck. Twin transom doors with steps to the integrated swim platform. The full beam crew quarters are aft of the engine room and feature twin bunks, night stand, hanging lockers and refrigerator. The crew has their own head with shower. This area is accessed from a separate entrance in the cockpit so the crew does not need to enter the salon to access their quarters. There is also a full height transom door that provides access while not at sea. This door takes you through the storage area and crew quarters to the engine room. This is the Preliminary listing.